Back in February, Giorgio Armani released two fragrances: one “old” (Eau Pour Homme) and one “new” — Eau de Nuit Pour Homme*. I wonder if either of these launches generated any real excitement in the perfume-o-sphere? Certainly Eau Pour Homme has its loyal fans, but Eau de Nuit had a quiet launch — for awhile, it was a Neiman Marcus exclusive. Perhaps Armani fragrances are more popular in Europe than in the U.S.? Eau Pour Homme is a well-made re-issue/reformulation. Contrary to some reports I read online, Eau de Nuit Pour Homme (same bottle design as Eau Pour Homme except the glass is black) isn’t a darker/richer version of Eau Pour Homme; it’s a distinct (if not exactly distinctive) fragrance experience. Eau de Nuit goes on smelling a bit soft and thick, as if bergamot and pink pepper had been blended into a dense cold cream (neither note has much impact). The next phase of Eau de Nuit, arriving seconds after the opening, is spicy — a mix of sweet nutmeg and cardamom — with a hint of heliotrope. The heart of Eau de Nuit does not exactly smell sudsy or talc-y, but it reminds me of an old-fashioned toiletry product an “English country gentleman” or “clubman” would keep on his dressing table. As Eau de Nuit segues into its final phase of development, a rich tonka bean accord takes over (tinged, perhaps, with some tobacco). If you don’t like tonka bean scents, skip Eau de Nuit, because the note you’ll smell most, and longest, is tonka bean. As for Eau de Nuit’s “iris”? After wearing Eau de Nuit for three days in a row, I didn't detect even a whiff of iris; and if iris is present, it’s fleeting — skip a breath and you’ll miss it. Eau de Nuit is a nice men’s scent, and one of my favorite non-Privé Armani colognes, but I wish the fragrance had some edginess/originality (having a men’s cologne depend on tonka bean for its personality is just too easy). Using my very own Now Smell This grading system: Armani gets an “A-” for Eau Pour Homme…and a “C+” for Eau de Nuit. Giorgio Armani Eau de Nuit has good sillage and excellent lasting power; it's available in 50 and 100 ml Eau de Toilette ($66/$84). *Listed notes: bergamot, pink pepper, cardamom, nutmeg, heliotrope, iris, cedar, amber and tonka bean. I haven’t even heard of these. Would like to try them, though, I doubt that they are at the departments stores nearby. I’d have to check. Yes, Kevin in the U.S., Pacific side. Maybe I will see in trickle in at some point? Nice sounds, well nice. One son needs something that isn’t edgy or reeking of some odd note for an office job so this could be a good gift. The price is nice too! I was thinking it sounded like a safe gift scent, too! The man in the ad sure has a striking (although not precisely handsome) face–is he supposed to be someone I know? Marjorie Rose: HA! 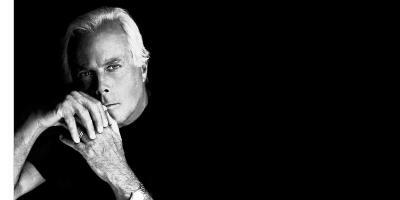 Giorgio Armani. Wow, is that really airbrushed or is it a picture from 20 years ago? It does sound like a nice office scent. Maybe a bit of both:D. lol. Longlegs2: it’s an older picture for sure…. It does sound “nice”, but there are already so many “nice” fragrances. Hoped it would be a little edgy due to bottle and name and I need a new cologne to wear out at night, but I will have to smell it myself for final judgement. Giorgio still looks great! Chandler B: seems many companies associate tonka bean with nighttime! And you’ll have lots of choices if you love rich tonka bean aromas. I must say this hasn’t made much of a splash on this side of the Atlantic either. It sounds very, office scent, unlikely to offend or arouse anyone… unlike the Prive range which have me consistently hot under the collar. Perfumed Dandy: Maybe this one is more likely to make people drowsy? HA! Hi Kevin, you call Eau de Nuit one of your favorites in the line so it must smell very good?! What would be your rating for only the scent without taking into account how original or edgy it is? I am always so pleased if I find a really good smelling fragrance that I already find this a great achievement. I keep mentioning it but I love Rose Barbare for that reason. 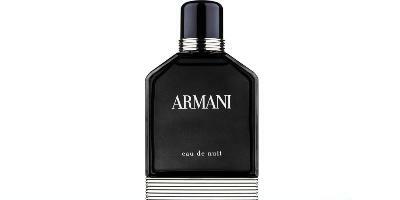 Cybele: let’s put it this way…the ONLY other Armani from the “regular” line I like is Eau Pour Homme (which I own). I like several from the Prive line. This is a well-made fragrance, but there are so many out there that smell just like it, it doesn’t excite me. The price is nice and it has cardamom, so I will give it a sniff if I see it. Kindcrow: as with tonka bean…you’ve got QUITE the fragrance choices out there if you like cardamom…it’s everywhere these days. And you’re right…$66 is a good price these days for a designer scent. It’s funny – cardamom is apparently in everything these days, but when I sniff the real deal (ie. ground cardamom, or whole pods in a jar), only Cartier’s Declaration comes to mind as a perfume equivalent. Its the Ur-Cardamom. Seek out that stuff if you’re a cardamom fiend (as I am). I do get slight whiffs of it in other mainstream fragrances, but Declaration goes all-out. sudsy and talcy are definitely words that turn me off of a fragrance.